Ed. Note: Today (Sep 30th) this legislation was tabled…so for now, never mind. It’s back in the FCC’s court. Legislative text put forward by Rep. Henry Waxman (D-CA) under the banner of mandating network neutrality would instead prevent the government from requiring broadband providers to treat all Internet traffic equally. 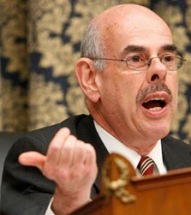 Waxman, who has vowed that he would support the so-called ‘Net Neutrality’ policy proposals favored by most Democrats and progressives, has instead put forward an as-yet-unsettled legislative framework that explicitly prohibits the Federal Communications Commission from regulating broadband Internet under Title II of the Communications Act: a caveat key to implementation of what’s been called the Internet’s First Amendment. Should the president sign a bill containing Waxman’s language, it would effectively kill ‘Net Neutrality’ efforts and make key parts of a hotly contested proposal by Google and Verizon the law of the land. I recently read an article claiming there is no political right or left anymore, that now there is only pro-corporation or pro-public with both Republicans and Democrats entrenched on the side of corporate power. Personally, I have long argued this case while at the same time recognizing Democrats will at least, on occasion, first shake the hand of people they stab in the back while the Republicans will just unapologetically knife away. Articles such as this one about Mr. Waxman’s recent sea-change on internet freedom only confirm these beliefs. When it comes to the internet, Democrats have long been the party who has stood on the side of net-neutrality while Republicans predominantly claim free market and push in favor of the Telecoms, consequences to the free exchange of information on the internet be damned. Net-neutrality is good for consumers: it gives them freedom of choice in providers and content, and keeps consumer costs lower by preventing companies from charging for certain aspects of internet use. Net-Neutrality is bad for corporations: it prevents them from controlling competition by slowing down traffic to competing websites. It prevents them from restricting access or charging more for accessing certain types of web traffic like file sharing, gaming…etc. Waxman has long gone on record in favor of net-neutrality…over and over, yet now he introduces the framework for legislation that would crush the very idea he champions with language that is bad for consumers, but great for corporations and my concern is because people will recognize Waxman as a Democrat, consumers will not read the fine print of his bill and just assume it’s a good thing, when in fact it is not. Any way you cut it, Waxman just did Google and Verizon a big favor, and made things tougher for the FCC to keep your internet free and open. Any way you cut it, the Democrats are trying to screw you again in favor of big business.